For the second year in a row, the No. 24 Hendrick Motorsports car will start on pole for the Daytona 500 next Sunday. But, uh, there’s a different driver in it. While former No. 24 driver Jeff Gordon called the qualifying session from the broadcast booth, rookie Chase Elliott put the car back out front again. Elliott logged a qualifying speed of 196.314 mph around Daytona International Speedway in Sunday’s qualifying session, putting him just ahead of outside polesitter Matt Kenseth on the board. The lap makes him the youngest driver to sit on pole for the event at 20 years old, per NASCAR. But those two drivers are the only ones who know where they will start the race from, as the rest of the field will decide starting positions in the two Can-Am Duels on Thursday night. For the Daytona 500 only, a special qualifying format locks in only the top two starting positions by time. 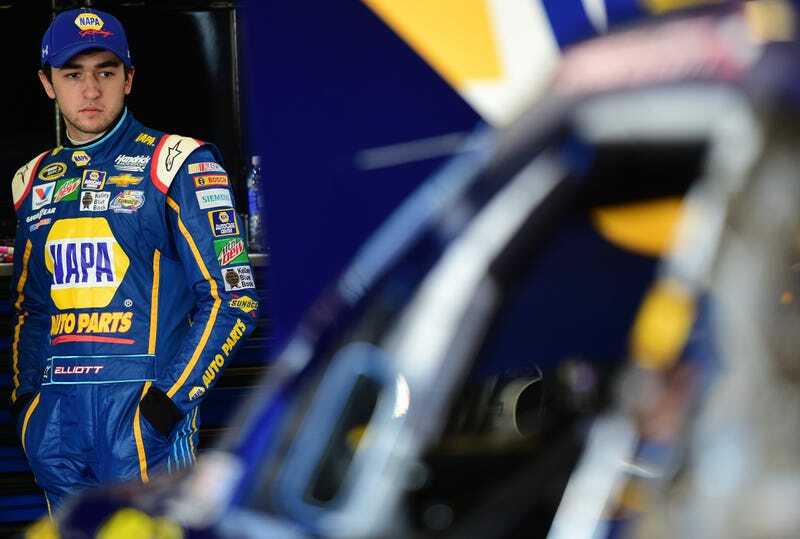 Each of Thursday’s 150-mile Duel races will line up by qualifying results, and the finishing positions from that event will determine how the field lines up for the official season-opening race on Sunday. Out of the cars not guaranteed a start in the Daytona 500 due to NASCAR’s new “Charter” system, two drivers locked in their spots in the race today—Wood Brothers Racing’s Ryan Blaney and BK Racing’s Matt DiBenedetto, according to NASCAR. There are 44 entries for the Daytona 500 and the Duels will decide the final two spots in the race, meaning that four drivers will go home. Three drivers will go to the back of the Duels after qualifying—Kevin Harvick, Brian Vickers and Martin Truex Jr., who didn’t post a qualifying time. ESPN reports that officials held Truex from making a lap due to a noncompliant roof flap, while disallowing times of Vickers and Harvick—both in Stewart-Haas Racing cars—due to noncompliant track bars.